3 Pc. 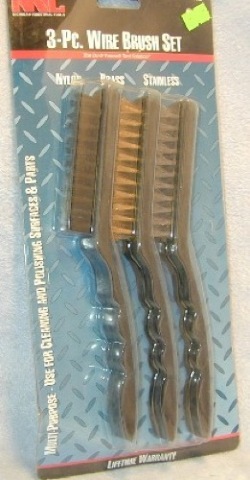 Wire Brush Set - Nylon, Brass and Stainless. 3 Pc. 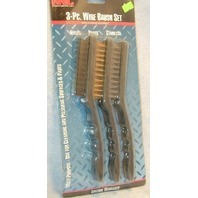 Wire Brush Set. There is one nylon, brass and stainless. The bristles are 3 1/2" long - the whole brush is 9" long. They are lightweight nylon handles with contoured grips. Each brush has 3 rows of 2--wire bundles. They are great for cleaning, scrubbing or polishing surfaces or parts. Brass Bush cleans objects sensitive to sparking. Nylon Brush cleans delicate parts and surfaces. Stainless Steel brush attacks heavy duty jobs. This group compliments each other.